One of the highlights of When the Day is Done: The Orchestrations of Robert Kirby, released earlier this year (Kirby is best known for his work with Nick Drake) is a track called “White Witch” by a band called Spriguns, from 1977. A tasty slice of mellow British psychedelic folk, one wonders how the band has remained so little known. However, it turns out original copies of their last two albums, Time Will Pass and Magic Lady, go for big money. So, they aren’t totally obscure, at least to some. Regardless, they released their first two albums—Jack with a Feather and Revel, Weird and Wild – in 1975 and 76 respectively. Those first two are very much in the traditional English folk vein, sort of Steeleye Span-esque. 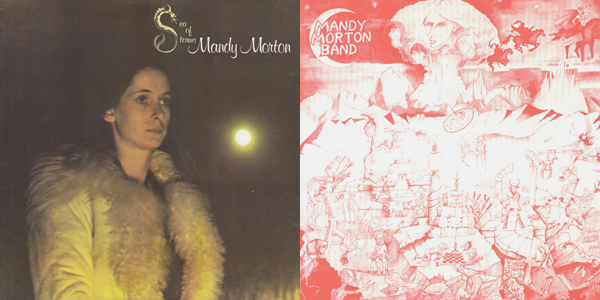 Lead singer Mandy Morton had a voice perfectly suited to the material and was often compared to Sandy Denny. And in fact, Denny was a big influence on their music – to the point that their final album, Magic Lady is named for Denny, who had died during the album’s recording. 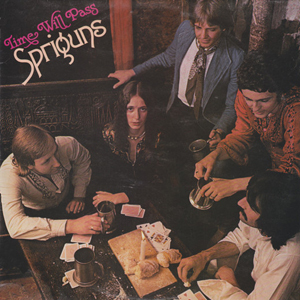 It was a bit earlier, with their third album Time Will Pass, that Spriguns seemed to find their feet – having dropped the “of Tolgus” and injecting a healthy dose of electric guitar and mixing the folk with rock and prog, with almost all new band members. Its from this album that “White Witch” comes. All the songs were written by Morton, except an amplified version of the old “Blackwaterside,” featuring some hot electric guitar. The title song is another standout. In the end, it was their occasional interest in the occult and dark subjects (“Dead Man’s Eyes”) that helped give them longevity and made them stand out a bit more from the pack. 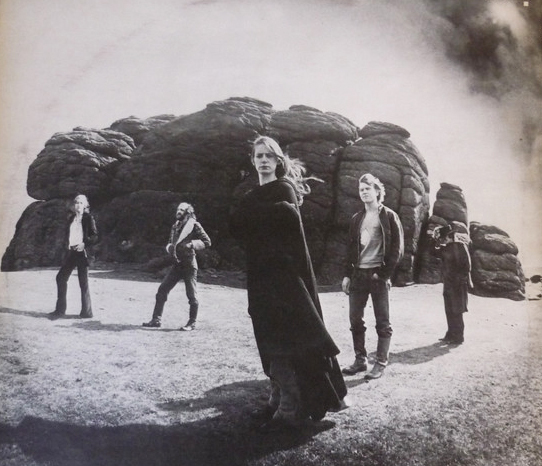 (Though, it should be said that the “pack” of other British psych/folk musicians had pretty much receded by then, and in the late 70s Spriguns was one of the few still carrying the torch.) 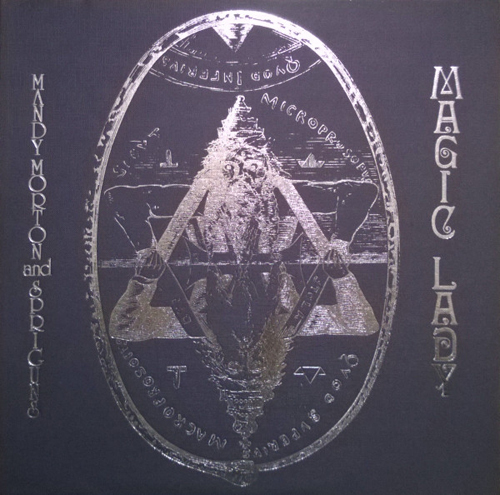 The creepy album cover of Magic Lady, in itself, has probably made the album so coveted these days and made it seem more mysterious than it really is. In reality, there’s not a lot of fringe stuff on Spriguns’ records. Sure, there are flirtations with the occult on songs here and there – the aforementioned “White Witch,” plus “Witchfinder” and “Devil’s Night” – but they’re outnumbered by songs dealing in relatively tame subject matter – love, seasons, nature…in short, time-honored subjects of English folk music. Then again, there are plenty of traditional songs about the supernatural as well. Mandy Morton went solo after Magic Lady with Sea of Storms and followed it up with one more in 1983 called Valley of Light. These were a continuation of the Spriguns sound, but with more contemporary instrumentation and a moving away from folk. These and all the Spriguns albums were eventually reissued on CD, but are still a bit scarce and pricey. Where did Morton end up? Well, she became a BBC radio broadcaster and now writes a “cozy mystery” series of books about cats…come to think of it “Spriguns” would be a good name for a feline. Interesting – yes, I could hear Fairport and Nick Drake in the first few lines of White Witch. Definitely – I think they would have been bigger if they had been 6 or 7 years earlier.